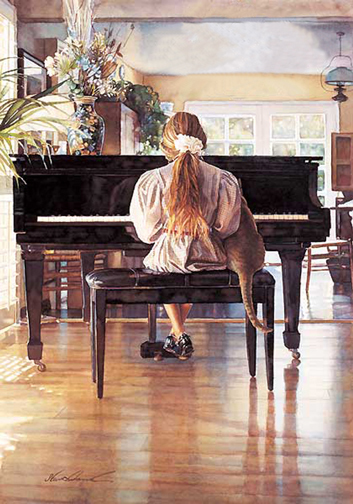 “When a child is learning a musical instrument,” says Steve Hanks, “it’s difficult for the student as well as their family to patiently endure the practice time. The presence of the cat in Duet shows that practice has paid off and now the music is so comforting that even the family cat will stay around to enjoy it. “My paintings of children are about my hopes and dreams for them, and about my desire to expose them to the arts: literature, art, music, dance and theater. I want to encourage them to make decisions for themselves, to stand on their own two feet, to think for themselves and to reach for their dreams.” This Greenwich Workshop Fine Art Anniversary Giclée Canvas, reproduced from one of Steve Hanks’ most beloved paintings, will make a heartwarming addition to any music room or office or a thoughtful gift for the aspiring musician in your life.